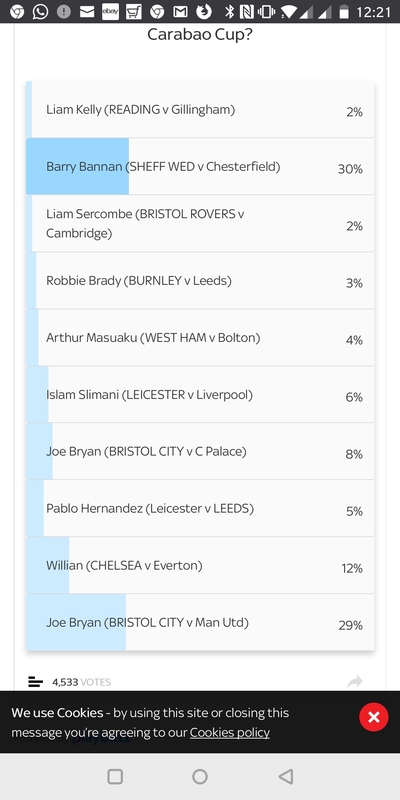 Stuck about 50+ votes on, but had to do it manually, can't do this tech savvy malarkey. While I was on voting went from 4000 to 4200, but Bazza went from 22 - 25%, Brizza dropped from 32 - 31%. Back on it later. It's sussed out my incognito window though, what else can I use? Opera built in vpn, not cheating, it's creative thinking. Took some reight doing. Been hammering away for last couple of hours!! Bristol fans have no clue whatsoever. they should of picked one of the goals for all to vote for and they would be leading. shocking tactics. This site must be rigged, collectively, we musta put about 50,000 votes on, but only 4,000 odd are registered.